Great love, as history has shown us, often births extraordinary architecture. In this bungalow in Singapore’s Cornwall Gardens, a couple’s desire to create the most attractive home for their family has been realised; it is a contemporary feat of design inspired by love – with nature at its heart. “The owners wanted to create a tropical paradise,” says Chang Yong Ter, founder and principal architect of Chang Architects. This was the third time the owners, in their 50s, had moved, and they wanted this home to be their last. “They want a home their three children (who are in their 20s) would never want to move out of,” adds Chang. It’s not an easy undertaking, harmonising the desires of modern-day dwellers with nature, but Chang, with his eye for detail, was ideal for the task. 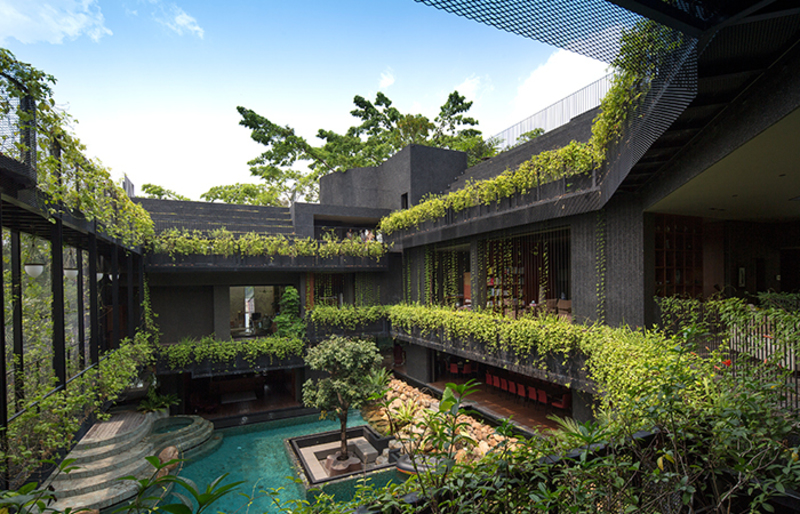 His achievements include a series of award-winning houses – the Lucky Shophouse, which won 2013’s President’s Design Award; and Elok House, an earlier project where he first explored this progressive vision of living with nature.